One thing I don’t think (no, I’m sure) I’ve ever had to prepare for in travel plans is for volcanic activity delays …. We started out our trip in Vernon at 8 ish on Wed morning – all flights looking like they are just fine and dandy ……. Flight to Calgary was smooth and simple – got there to find out we had a 2 hour delay before our next flight to Puerto Vallarta. Next thing we knew it was cancelled altogether due to the volcanic ash in the air from activity in Colima, Jalisco, Mexico. It was a definite no fly zone. I suppose we could look on the bright side and be grateful that we weren’t on the flight the day before – they flew all the way to 30 minutes from Puerto Vallarta before being turned around, and came all the way back to Calgary. Now, that would have been frustrating. In any case, we found ourselves spending the night at the Clarion Hotel in Calgary before again leaving for the airport at 5:30 a.m. This time it was clear and sunny in Puerta Vallarta, so the flight went off without any issues. Sadly for us, this meant we missed our flight to Leon in Guanajuato state. Not to be deterred we got off the plane, walked across the street for a marvellous taco and hopped into a taxi to go check out the bus schedules. Two buses later and a night in Guadalajara we arrived in San Miguel de Allende. Simple, right? Maybe, but it took 52 hours of travel time! 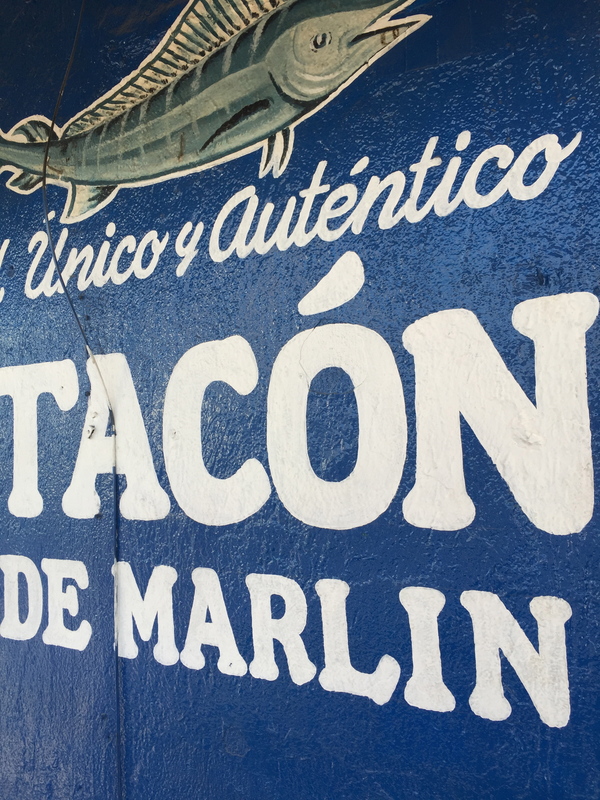 Right across the street from the PV airport, these amazing fish tacos are huge and will immediately satisfy your craving for a taste of Mexico. 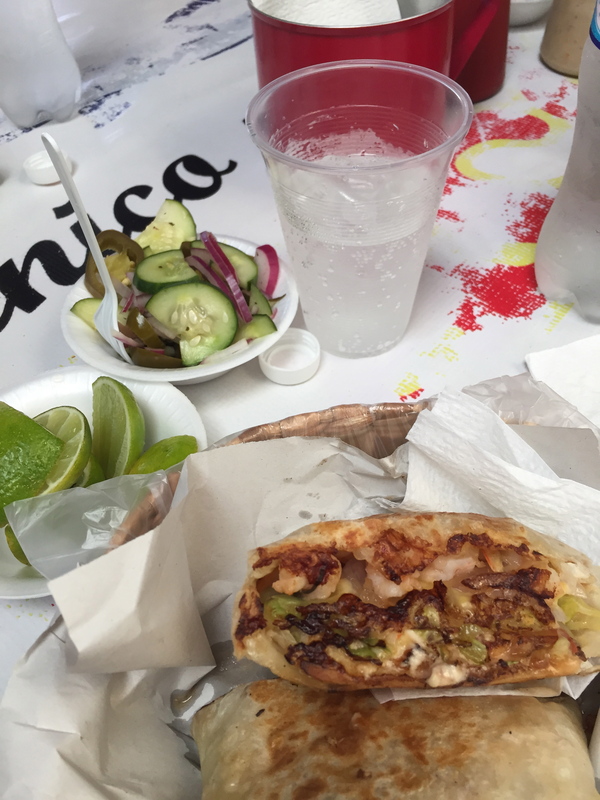 This was my dainty little shrimp taco (camarones), and it was anything but dainty – however it was delicious! 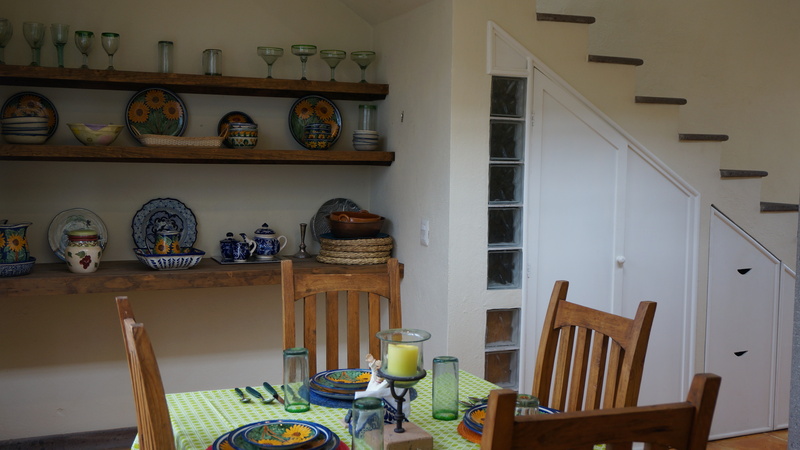 Our Mexican dining room in San Miguel de Allende, we love it here! 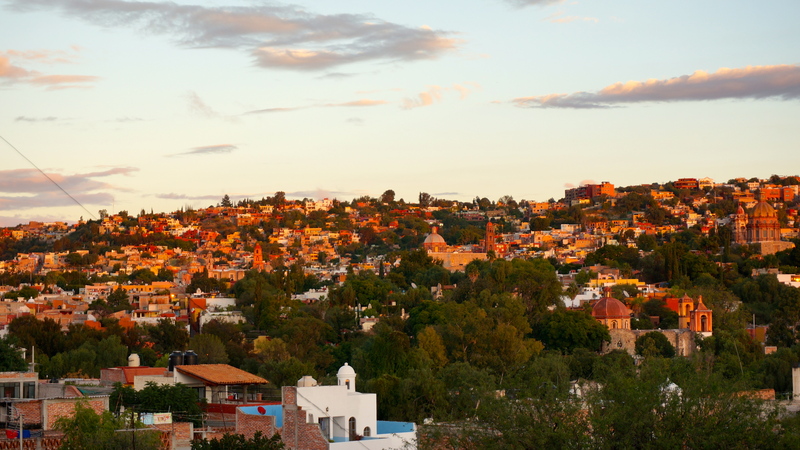 As the sun starts to set over San Miguel de Allende you can see the pastel colours and the amazing view from our rooftop deck. This is the most beautiful office I’ve ever worked, and done my blog from, and it looks out over amazing flowers and garden area – the wall is all window. Our first day we walked about five hours, and no I’m not exaggerating ….. in these areas you are either walking up or down hill – no flat areas. Yes – we walked all the way up from San Miguel to El Charco – the botanical gardens. About 1.5 km up and then it was about 3 km walk through the gardens before heading down. Amazing cactus throughout the botanical gardens. Having heard that these red fruits on the cactus plant are edible, Grant plucked one off … trying to avoid the spikes (not totally successful in that), broke it open and we all had a taste. Not very flavourful, and what we didn’t notice was all the teensy tiny barbs on the fruit itself. Everybody was having mini barbs stuck in their lips for quite a while ….. Always a cathedral handy – every barrio (neighbourhood) has their own, and even in some small towns the church will be very elaborate. After all that walking we rewarded ourselves with dinner at “Aperi” … and thoroughly loved the 7 course tasting menu, accompanied with wine pairings …. no Grant did not do the wine pairings. It really was a “foodie” dream come true. Sadly, this photo does not do the pork belly justice – arrived with the upended margarita glass leaking smoke, and the hickory scent wafted up as the glass was lifted away. That pork belly was out of this world delicious. Just a few of the other courses – unbelievably beautiful and delicious, every plate was dreamy. Gorditas – slightly thicker tortillas, and then stuffed with your choice of many fillings – a great quick lunch. These ladies sit in the parks all day stitching up “Lupita” dolls. The next day we played tourist and went on a couple of tours – Wilson went “birding” and Viv and I took in a house tour. Grant …. had lime ice cream and walked around. During edit stage of this blog, Wilson wanted it mentioned that he saw some birds. One of the beautiful bedrooms on our house tour. Most Mexican style homes are centered around a courtyard – and this one was amazing – so lush. It is hard to believe what is behind that doorway right off the street. Morning mist over San Miguel de Allende – floating away to leave a beautiful day for us. Hotel Rosewood had a beautiful roof top bar to enjoy a sunset. San Miguel de Allende is truly a gorgeous place, and it is easy to see why it becomes home to so many ex-pats. Primarily US but a good showing of Canadians as well, along with a sprinkling of the rest of the world. Actually …. a few years ago it was voted by Conde Naste as the Number 1 place to live, in the whole world. My drink – mescal, cucumber, lemongrass, and soda water. I’d like to post Grant’s drink (beer) and Wilson’s (red wine) but they are boring. Main salon at our Casa, and home of the nightly crib match for Grant and Wilson. Whipping up a dinner of carnitas (slow roasted pork), potatoes and zucchini, green beans and salad. The joys of having your own kitchen. While we all thoroughly enjoyed San Miguel de Allende, it is time to move on ….. and we have to say that this whole Air BNB gig is the best. We just love having a place to lounge in the morning, relax with your coffee and take your time getting going – eat in or out as your mood dictates. Time to move on to Guanajuato – only 2 nights there to explore a beautiful silver city. More on that to come ….. This entry was posted in Travel, Uncategorized and tagged Mexico, San Miguel de Allende, travel by Chatty Kathy. Bookmark the permalink. Glad you enjoyed the post – we always spend time away from the beach as well as one the beach in Mexico, and while I love the beach for relaxing, I love inland Mexico for the personality and beauty.